Having 126 territories and 4 even corners, this map is good for 4 player FFA or 2v2 team battles, having players choose a center tile in each corner of the map. The map does not have to be played this way, but the map was designed with this idea of a game in mind, where every player has an equal advantage and skill is the main factor. This is my first map, and also the first of a series of maps I will be designing with a hexagonal format, resulting in a play style with many strategic advantages and disadvantages. I have mad a full 1000 x 1000 px base of adjacent hexagons so that shapes can be removed to create any map design that I want. 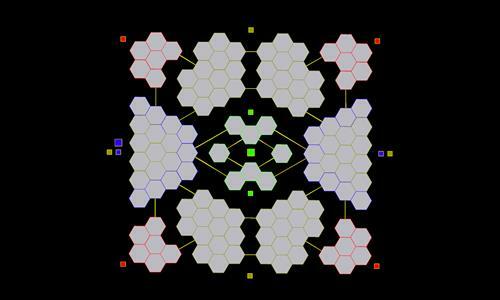 So if anyone has an idea for a hex map they would like to play, message me! Review by Andalorium on 10/20/2016. Decent idea and layout, but the bonuses could use some work I understand the four corners thing but everything else is so spread out it is difficult to truly get any other bonuses except the middle which has choke points to work with.